I did an apt based upgrade from Dapper to edgy and now some fonts are rendering badly in some apps. UI and content fonts in OpenOffice.org and Firefox. 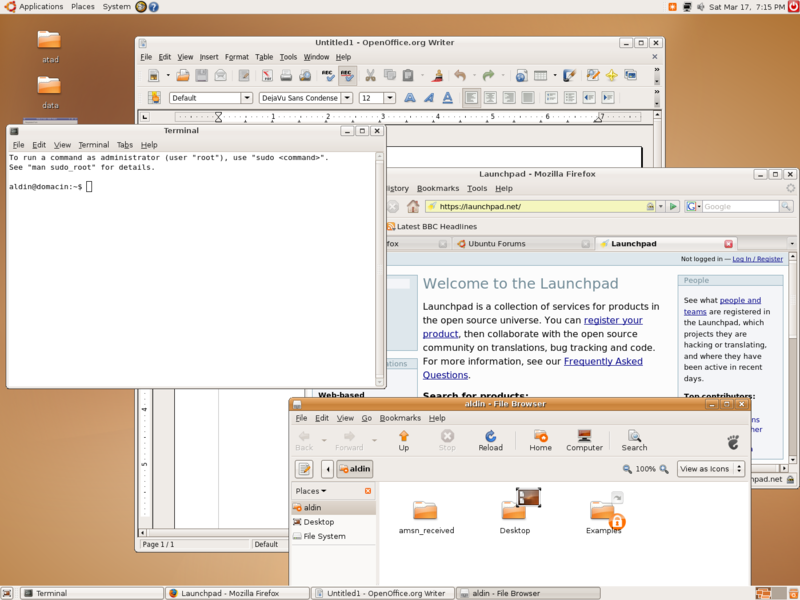 Attaching a screenshot demonstrating the issues. In the attached screenshot if you compare the monospace rendering in gnome-terminal with that in the font picker preview. Also compare the menu fonts for OO.o and FF with that of gnome-terminal. I can confirm this bug; coming from Bug #58511 where several people also have this issue. I think the right package is fontconfig. I can confirm the bug using medium hinting. When using full hinting, all fonts are not blurred. OpenOffice seems to do its own stuff with font rendering, and is not affected by Xft settings. This is really annoying me, I think a separate bug should be opened for it. I want to add that the content area of the Epiphany browser has also no hinting - this is probably caused by using the Firefox render engine. > hinting - this is probably caused by using the Firefox render engine. The same is true of Yelp, when the font is set to the default Sans. Changing it to DejaVu Sans improves the look considerably. I’m using Kubuntu Edgy and in my KDE desktop fonts look ugly everywhere. They are blurred and have become slightly smaller than they where in Dapper days. Attached is a shot taken from Konqueror’s window. Tabs in the top use DejaVu Sans 7 and text in the comment boxes use DejaVu Sans Mono. I was hasty in my previous comment. It seems that when I select “Hinting style: Full” from KDE’s settings, I get same kind of sharp fonts than in Dapper—at least with KDE programs. With Dapper I always used “Hinting style: Medium”. the medium hinting rendering of fontconfig has changed between dapper and edgy. What is very weird is that the behavior is inconsistent depending on the app. The only bug here is the inconsistency when using medium hinting, right? The firefox m is from the "Bookmarks" menu and looks very bad at a normal distance. The gedit m is from the "Documents" menu and looks crisp. Note that that screenshot looks fine on some monitors (you cannot see the problems), so the photos are probably more useful. This did not occur in dapper. Now I'm not sure why firefox doesn't use that. Maybe you've conflicting fontconfig settings. Do you have a ~/.fonts.conf file? Yes, I did have a ~/.fonts.conf file. I don't remember ever creating it, and definitely didn't put it there myself while running Edgy (so it would have been there in Dapper, but I didn't have these problems there). I've removed it and fonts in konsole, firefox, kmail are all fine. Thank you. Apologies for filling this bug with bogus info! Well, it's not your fault, the fact that you've different way to configure fontconfig is quite odd, and I don't know how it can handled correctly, and I don't know why all apps don't react the same way. The ~/.fonts.conf was most likely created by kde. Gnome only exports Xft resources. Kde does that too, but also write the ~/.fonts.conf file. However, I believe that it's a different issue than the original one, maybe a different bug should be opened? Because even when both ~/.fonts.conf and Xft resources specify medium hinting, the rendering is still different between firefox and gnome-terminal, and the rest. Does anyone have an idea what firefox and gnome terminal have in common in the way they render fonts? Since there aren't so many apps that behave this way, the problem could be in these 2 apps. 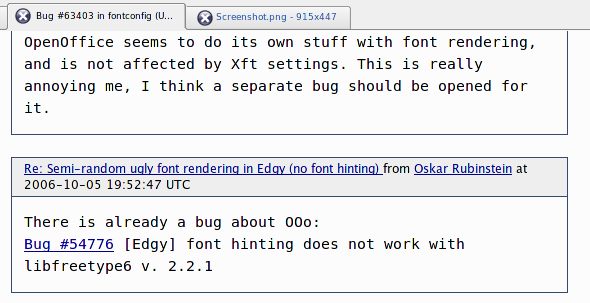 Have a look at bug #60760 - turning off autohinting has no effect - maybe the new freetype and xft is the root of cause. i also had a .fonts.conf and renaming it so it's not used for fonts helped for firefox... fonts are now much better in firefox. my .fonts.conf was from 2004-10-23... so in my case it's not from ubuntu. i've carried my home directory from other linux distros. the file was probably created by mandrake. This is getting really confusing, that's why I was trying to sum it up. Please only talk about 1) here, unless you are able to identify duplicates in the above 4 issues. Yes, (1) and (3) are definitely separate issues. I am seeing different rendering in Firefox and gnome-terminal (1) even though I have never had a ~/.fonts.conf file (3). for the way fonts looked in the terminal before fixing (3). >When using full hinting, all fonts are not blurred. This is still true for me though. Strange behaviour. This strange behaviour is issue (1), which I believe this bug report was about. I believe you only had issue (3). However, (1) and (3) could be different consequence of the same problem, since it seems like the same apps are affected (contents of gnome terminal). It seems to me there are much more apps that behave correctly than not. The apps that don't behave correctly are widely used though (gnome terminal, firefox and openoffice). I'm not sure this is a fontconfig problem, and not a problem in these apps. It just was more obvious to establish openoffice was in fault, because it's much more broken than firefox or gnome terminal, so there is already a specific bug report for it. Sweet! deleting $HOME/.fonts.conf fixes it for gnome-terminal and gecko at least. Still it's a bug though, and it didn't exist in dapper. Nautilus is in the background and Firefox is in the foreground. I thought deleting ~/.fonts.conf would fix the problem but that file wasn't there. Has anyone got any suggestions of what I could try next? You could try to create a .fonts.conf file with the following content (that's what KDE would add if you select RGB hinting and full as the hinting style. This makes my fonts look nice again. For everybody concerned about case (3) in comment 20: I filed bug #69091, and I think my issue is at least related to (3). I can confirm this bug. Yesterday I updated my laptop to Edgy. One of the first things that I say when Gnome session starts: Fonts problems! (specially on gnome-terminal and Firefox). I look for information about it and I discovered a solution: Go to System->Preferences->Fonts and select "Subpixel Smoothing". After that my problem was fixed. Gnome must configure this value by default. Another workaround for Firefox: enable Pango. I also experienced this after a clean install of kubuntu 6.10. The fuzzy fonts appeared in all apps and all fonts. The fix was to change the antialiase hinting from the default of "medium" to "full". Now firefox, and all kubuntu apps are ok for me. >Still it's a bug though, and it didn't exist in dapper. I'm using 8px Tahoma font with no antialias (as in Windows XP), so in OO.org it looks ugly. Not only in interface, in documents too. I think it's an issue of openoffice-gnome package. The same problem was earlier in Cedega, but has been solved.